BLAST DIRT & GREASE AWAY-CLEANS FASTER, EASIER, BETTER. NEW 2019 Commercial Gold Series, (Fully Self Contained Just Hook up to a Water Source) 4 GPM @ 4000 PSI 13hp HONDA engine (c/w 3 year warranty), electric start, 18 amp charging system, 12 volt DIESEL burner, adjustable pressure & temperature control, Triplex Plunger Pump w/stainless steel valves & all brass head, 50' High Pressure Hose, Gun, Wand & 5 Nozzles plus Soap & Chemical system. Priced @ $6,696 - $1,000 (factory rebate) Total $5,696. Our 2018 New 15hp, electric start Magnum Gold Series units are priced as low as $3996. We also have Electric washers w/diesel burners, Commercial Units, or we can build one to fit your needs. Call Dale 780-983-5582 Watch the video. 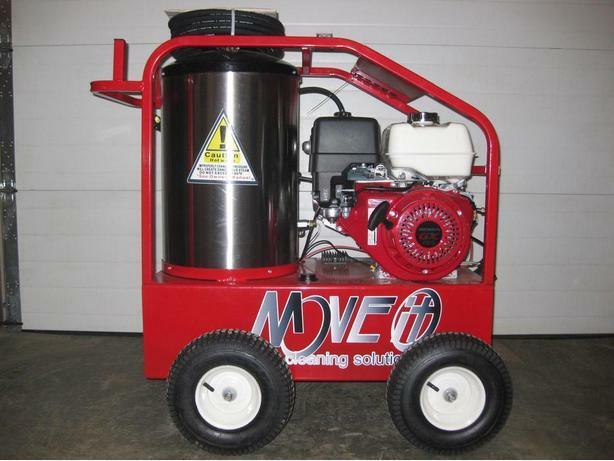 All our Hot Pressure Washers have a FACTORY REBATE of $700 to $1,000 off, We can direct ship to you. BUILT FOR PERFORMANCE, EFFICIENCY, DURABILITY & MOST IMPORTANTLY, "RELIABILITY"